Two people were killed and another injured in a crash in Delray Beach overnight. 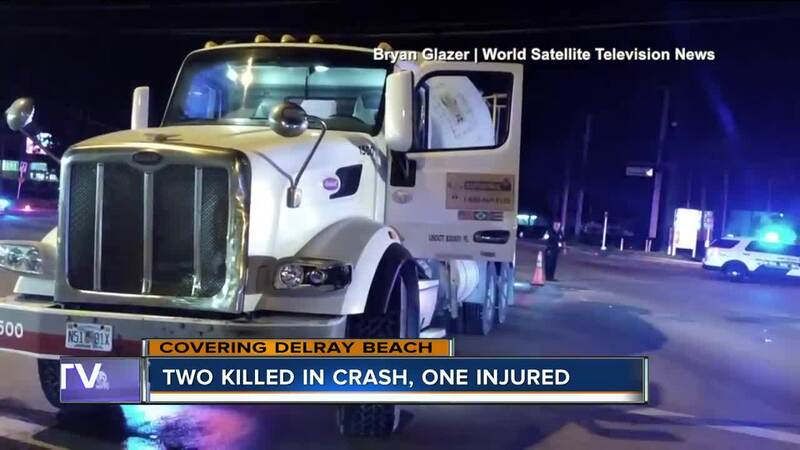 UPDATE: Terrence Shapiro, 48, of Boynton Beach and Siobhan M. Stackpole, 44, of Boynton Beach both died when a pickup collided with a cement truck in Delray Beach Saturday, according to police. investigators say Shapiro was driving the pickup north on Congress, ran a red light and collided with the southbound cement truck that was making a turn. After the impact, the pickup truck then hit a power pole, shearing the pole in half, police said. A third passenger inside the pickup was injured but survived. DELRAY BEACH, Fla. -- Two people were killed and another injured in a crash in Delray Beach overnight. The crash happened at 12:15 a.m. at Atlantic Avenue and Congress Avenue. Delray Beach Police says a pickup truck with three occupants was traveling northbound on Congress Avenue and apparently ran a red light, colliding with a southbound cement truck that was turning left onto Atlantic Avenue. After the impact, the pickup truck then hit a power pole, shearing the pole in half and cutting power to the intersection. Two of the occupants were pronounced dead. The third was transported as a trauma alert to Delray Medical Center. The intersection was closed for nearly 5 hours as Delray Beach Police Departments Traffic Homicide Unit conducted their investigation. Anyone with information about this crash is asked to contact Investigator Henry Lugo at 561-243-7800.